← The new NHBC ‘Register of Site Managers’. Home » A million new homes by 2020? Who is the government kidding? On 21 September 2015, the then housing minister Brandon Lewis, stated on behalf of the government on BBC that it intends to build “a million new homes by 2020”. ie by the end of this parliament. A million new homes in a shade less than 5 years, around 200,000 a year. Big statement, big promise. Everyone will remember George Osborne’s “we are the builders” being seen wherever he could, wearing a hard hat and a hi-vis jacket. So how is this going? Well, recently released figures from the Department of Local Government and Communities (DCLG) show that just 139,030 new homes were built in the year to 30 June 2016. Whilst up 6% on the previous 12 months (131,500) and 29% higher than the low recorded to March 2013 (107,820), this latest total is still 18% below the peak in the quarter to March 2007 (168,640). Since the pledge to build one million new homes by 2020 was made, in the 9 months to 30 June 2016 just 104,140 new homes have been completed. So to be on course, another 95,860 new homes will need to be finished by the end of September 2016! Clearly it isn’t going to happen. But homes being started isn’t the same as homes being completed. The “started” quarterly figures will always be higher as builders seek to protect planning permissions etc. as is demonstrated by the recently released figures from the DCLG which stated 144,280 new homes were ‘started’ in the year to 30 June 2016. The National Housing Federation said that between 2011 and 2014 only 457,490 new homes were built, but according to its own figures, Britain needed to build 515,510 more new homes during this four year period – a total of 974,000 or 243,500 new homes each year. These latest figures only serve to demonstrate the industry’s continuing failure to deliver the homes that British people need. Current figures are way short of the 200,000 a year target and as long as housebuilders are allowed to hoard land in landbanks and build at a rate that maximises profits, Britain’s housing crisis will continue. 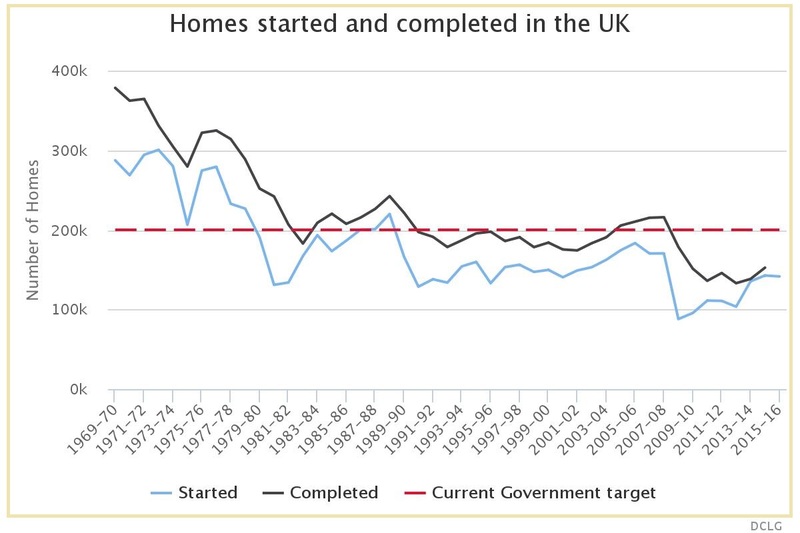 The plc housebuilders will never build enough new homes. Unless the government wakes up and begins a major council house building programme with new homes built by building contractors rather than relying on the plc housebuilders to build sufficient ‘un-affordable’ housing. This entry was posted in New Homes and tagged house builders, landbank, new homes. Bookmark the permalink. 2 Responses to A million new homes by 2020? We absolutely need more homes, all over the UK, but especially here in London. Great post, thanks. Valuable info. Fortunate me I found your web site accidentally, and I am stunned why this twist of fate did not came about earlier! I bookmarked it.